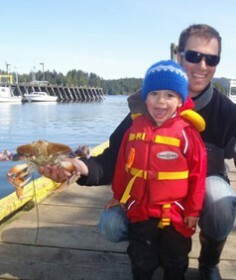 Inshore Family Fishing Experience Tofino B.C. Great for families new to sportfishing. Drop some crab traps and hit the salt for some first-time fishing lessons or just relax and enjoy the surroundings. A perfect opportunity to bring the grandparents and the grandchildren! These custom adventures take place in calm waters close to the shoreline and are fun for the whole family. All Cleanline Sportfishing charters are fully guided and outfitted for your fishing adventure. This includes all premium fishing tackle and bait. Rain gear will be provided for upon advanced request, but please bring your own if you have it. Charter: Includes all top-of-the-line fishing equipment and premium bait Children 15 and under ride for free when accompanied by an adult!